Are you a hiker? Artist? Skier? Biologist? Geologist? Nature-lover? Historian? Everyone here has a story of the mountains. 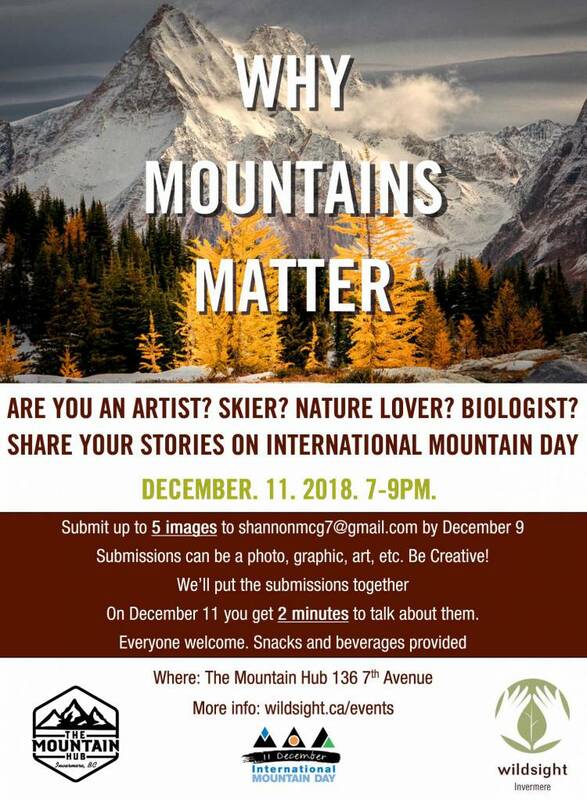 That’s why Wildsight Invermere is organizing a fun evening to celebrate International Mountain Day by sharing our experiences through images! Submissions can be a photo, graphic, art. Be creative! We’ll put them all together. On December 11, you get 2 minutes to speak. This is in the style of pecha kucha. The art of precise presentations! Feeling shy? Thats fine too, come watch others present why mountains matter and join in on the conversation! Everyone welcome. Snacks and beverages provided.